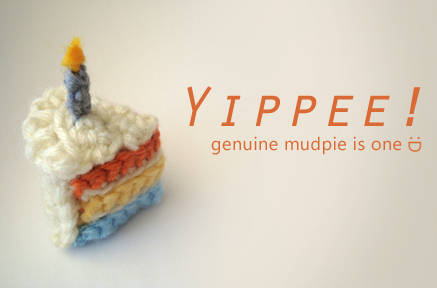 genuine mudpie turns one today! :D Here’s a look back at the year past. One important learning: trying my best to do something really, really well, regardless of whether it would be “worth it”. That was the thought that started this blog, and it is still the goal and spirit of genuine mudpie. Most of the things I make I don’t plan on selling, and I share my patterns freely, but the reward of the creating process is tremendous. I’m blessed to not have to think about making a living through the things I make, and I can therefore make whatever ridiculous things that make me happy. Writing here has kept me thinking creatively and helped me through some difficult times of doubts and uncertainty. And if what I make and share here can lead to one other person feeling happy or inspired or motivated to create, then it’s all worth it. One wonderful rediscovery: when genuine mudpie started crocheting was the only needlecraft I wrote about. But over the past year I’ve begun knitting again, and along with it the gateway to the vast and wonderful land of knitting patterns. Though as I started casting on projects I’m also reminded of why I gave up knitting in the first place — things can take a long time to knit. My first project was this jacket, which I actually completed but took apart, because it turned out too big. Since then I’ve started and taken apart 2 other cardigans. What happened, you ask? Well, I would start a project and before I get past the waist shaping I would come across another sweater that I like better, so then I would take apart the first sweater to start on the second one. Well, this has got to stop or nothing will get done! My goal, therefore, is to stick with the current cardigan I’m knitting for my mom and to have it done before her birthday in May. I can do this thing! One great undertaking: my Etsy shop opened after years of contemplating. I think having genuine mudpie the blog makes it a bit easier to make the commitment of opening genuine mudpie the shop. I guess it’s the fear of failing, you know, what if I put myself out there and I don’t get any sale? So it helps that I’m already “out there” through the blog. But I won’t lie, business has been slow. It’s a tricky business, because on top of the price for time and labour (and how does one put a price on that? ), there’s the Etsy fees and PayPal fees and the killer shipping fees. So the plushes are not as affordable as I’d like to price them, and perhaps that contributes to the slow sales. I don’t know. But somehow I feel perfectly OK about it. I guess part of it is that once I sew a face on a plush it becomes sort of a creature with character and everything and I have a hard time parting with it. But I would certainly be excited if they could go to a good home and put a silly grin on someone else’s face other than my own. So the shop is open for now, and people can go visit, and I’m happy about that. One awesome supporter: genuine mudpie would not be possible without my husband, Mike. The new site would not exist without his design and coding expertise, and my posts would be utterly boring without his help with the photo shoots. Most importantly, he was the one who encouraged, and continues to encourage, the whole crafting endeavour itself. “What if nobody reads it? What’s the point of writing a blog if nobody reads it?” I asked a year ago, as I was debating whether to start a craft blog. He said the same about the store too. I am so very blessed to have him in my life, someone who thinks that a crocheted tater tot is important enough to spend a whole afternoon taking pictures of it tumbling in and out a tin foil pan, someone who thinks that whatever is important to me is important to him too. I cannot ever thank him enough for being such a wonderful, generous, loving man he is. And I also cannot thank my family and friends enough (there are too many to name) for taking the time to read this blog on a regular basis, and for making a point to tell me that they enjoy it. I so, so, so appreciate your encouragement and kindness. It means the world to me to hear that genuine mudpie made you smile. One big thank‐you: whether you have been journeying with genuine mudpie for some time now, or you’re new to this blog, and whether we have connected through your comments, or you’ve been quietly reading, I’d like to thank you for being a witness to my creative process by visiting me here. 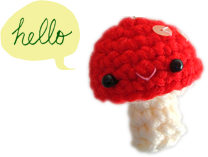 Thank you so much for stopping by, and I hope you continue to enjoy reading about my crafty endeavours and other musings here.